The mobile industry has changed tremendously since our Director of Product, Sam Benediktson, came on board in 2001. Back then, we were operating a pager business, believe it or not! We interviewed Sam to get his insights on how the mobile industry has changed, the trends he’s excited about, and what brands need to know. When Sam started at Vibes, mobile users could only text other people who were on the same carrier. But that changed as the carriers hired Vibes to encourage people to use SMS. Sam (who initially started at Vibes as a developer) found himself transitioning to an operational role as the texting frenzy got even crazier. Sam says he’s seen some pretty large leaps in mobile technology in the last 18 years. The cross-carrier texting was the first big change that impacted both consumers and brands. Vibes leveraged this technology change in the early 2000s to create today’s mobile industry as the market to shifted from almost no texting to what it is today. Around 2004, phone keypads went from “triple tap” — where users had to tap the 12 number keypads to get to the desired letter — to an actual letter keypad, thanks to Blackberry and Palm adoption. After that came the early days of mobile web, around 2005. Looking back, it’s funny to remember how clunky and awkward those web pages were on a phone compared to today’s responsive websites! Though the capability was there, there was little adoption. Then, of course, came the iPhone release in 2007. Its touch screen and apps changed the game for mobile capability. It also changed what Vibes could do as a business, and opened the door to working with the enterprise brands we work with today. Vibes was fortunate that the mobile carriers became big customers and fueled rapid growth for our business early on. It’s because of these long relationships that we are in the position we are today as a Tier-1 Aggregator. In 2010, Vibes began to focus on helping retailers navigate the world of mobile marketing. It took some work to shift the way brands thought about mobile. But mobile’s ability to bring transparency in showing immediate results on campaigns quickly proved it to be effective in quantifying the impact of TV, radio, or newspaper ads. “You can measure the effectiveness of traditional advertising channels with mobile,” Sam says. Not every mobile marketing tactic worked. Sam says that in 2007, all the companies in our space were focused on Premium Messaging, selling ringtones and wallpapers and other subscriptions. In addition to mobile centered inventory, at the time in Europe and Asia, using your phone to pay your electricity bill through your mobile bill was popular, but it never really took off in the US. Here, carriers took half the money for each transaction, which made it not compete with paying via credit card or bank. While tactics worked briefly to sell ringtones and wallpapers, once smartphones arrived on the scene, transactions billed through carriers, like wallpapers, ringtones, premium messaging, were completely wiped out. And QR codes, too, Sam says, never really made a splash in the US despite taking off in other international markets. Despite these tried-and-failed experiments in the mobile industry, the future looks bright. Sam foresees the level of visibility into mobile campaigns increasing even more than what it is today, thanks to data and insights. He sees video playing a bigger role in mobile as phone screens get bigger (like the up-and-coming flip phone that folds out to a larger screen). This provides brands with the opportunity to get more real time data from people watching videos and ads and for consumers to interact more with them. It’s all about data when it comes to the future of mobile. With more types of content consumed on mobile, there will be even more mobile data for brands to harvest and for AI-driven marketing to leverage. The old adage from nineteenth-century retailer John Wanamaker — “half the money I spend on advertising is wasted; the trouble is I don't know which half” — is no longer relevant, Sam says, because mobile helps retailers understand what advertising works and what doesn’t. After 15 years in the mobile space, Sam loves helping brands experiment, track, and learn to create their mobile strategy. Brands that use a targeted and personalized approach, and brands who have 1:1 conversations with their customers, find the most success with mobile marketing. Every industry has its own challenges when it comes to bridging the gap between digital and physical marketing. 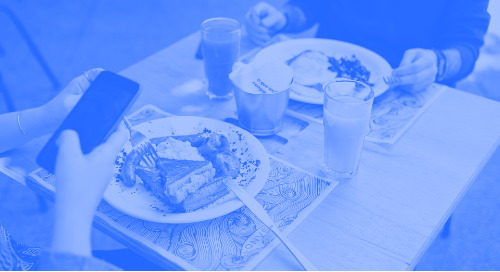 Here are a few ways that restaurants are successfully connecting the dots with mobile.